Tee's Blurbs: cooking 101: going mexican - beef quesadillas and tacos! cooking 101: going mexican - beef quesadillas and tacos! OLA! 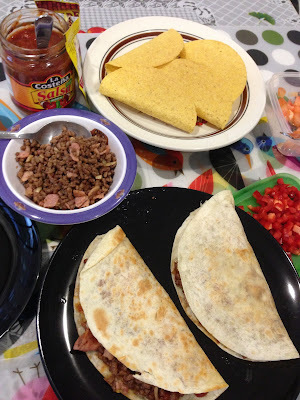 Wanting to try out something new and easy to whip in the kitchen, I decided on a mexican-themed dinner. The meat for both beef quesadillas and tacos is the same, so I just cooked it together and divided it afterwards. It's basically hitting two birds in one stone. With that, we had variety with less the effort. 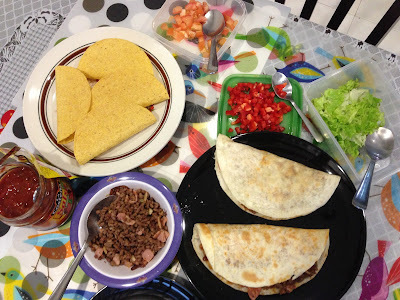 Here's how we made our tacos and quesadillas. Perfect for dinner nights when you only have a few minutes to prepare. 1. On a skillet, saute the onion and garlic. Add the ground beef when the onion have turn golden brown. When it is almost cooked, add the bacon slices. 2. Sprinkle the mexican powder mix. Remove from heat. 3. On another pan, add the butter and heat the quesadilla wrap. 4. Add a couple of spoons of the meat mixture, tomatoes and cheese. I just added it to half of the wrap so I can easily turn the wrap on the other side. You, of course, can fill the whole wrap with the meat, cheese and tomatoes and add another wrap on top. 5. Turn the wrap to the other side. When cooked (the wrap I bought cooks in about 30-45 seconds) or slightly browned, remove from heat and serve. 1. Prepare each of the ingredients in a serving bowl/plate, with serving spoons. I prefer to make my own taco so I can have the freedom to add what I want and how much I want it in my taco shell. 2. Do steps 1&2 for beef quesadillas. Remove from heat and add the meat mixture in a serving bowl. 3. Heat the taco shells per packaging instructions, and you're ready to go. cooking 101: steak, steak, steak!